4 film, 5 disc collection of iconic Spanish horror films from Amando de Ossorio. Blue Underground USA R1 boxset. Anyone famous in it? Lesser known euro cult star Jack Taylor appears in Ghost Galleon, but most of the casts are relative unknowns. Fans of euro-cult cinema should enjoy this boxset, and fans of Spanish horror should find it especially interesting. Visuals All films are anamophic and in Original Aspect Ratios. The picture quality is decent throughout, although often very dark. Audio All discs have original Spanish mono tracks. Ghost Galleon and Night of the Seagulls have English mono tracks as well. Subtitles Good subtitles are included for the Spanish tracks on all 4 discs. Extras All of the film discs include original trailers and image galleries. Tombs and Return include the original American theatrical edits, with original English language titles and English dub tracks. The Last Templar - a recent Spanish documentary about de Ossorio including interviews with a variety of experts and actors (including Jack Taylor, Paul Naschy and de Ossorio himself in annoyingly brief shots), plus an interesting collection of clips from his films. Edited in a rather modern style, it can get a little annoying (some extreme close-ups of the talking heads) but is worth watching. Spanish with English subtitles. (23 minutes). Unearthing the Blind Dead - an interview with de Ossorio shot shortly before his death. Interesting, and nicely edited with shots from the film. Spanish with English subtitles. (11 minutes). Farewell to Spain's Knight of Horror - a copy of an article written shortly after de Ossorio's for Shivers magazine. Short but interesting. Presented as a .pdf file. The boxset also includes a 40 page booklet - an updated copy of the Knights of Terror book by Nigel Burrell it provides interesting thoughts on the films, as well as background information about the director as even the Templar Knights themselves. Packing/availability Leather-style coffin box, containing 4 standard amaray cases, a slimline case (for the bonus disc) and the booklet. All four films are available on identical single disc releases (without the bonus disc or booklet). Other regions? 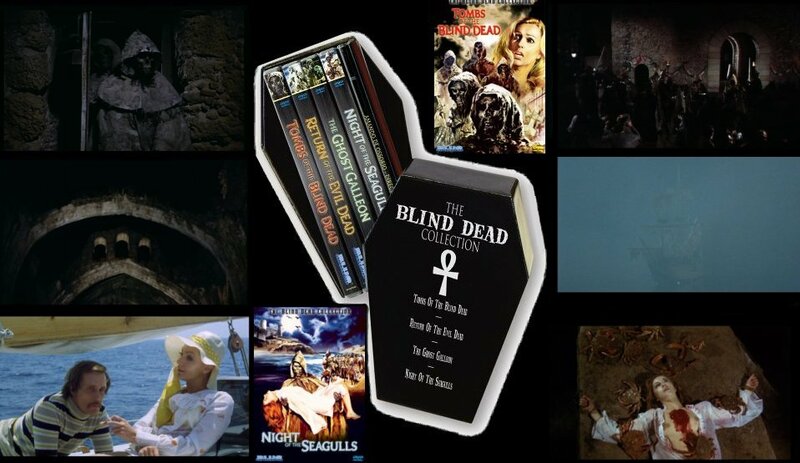 There is a similar boxset now available from Anchor Bay UK, packaged in a digipack, and as single disc versions. Unfortunately Tombs is cut by 16 seconds, but these shots are unlikely to be missed. Cuts? All films are believed to be fully uncut. Prints are Spanish language. An interesting collection of films, ranging from the good (Return) to the absolutely terrible (Ghost Galleon). Partly recommended to euro-cult/horror fans, but I would recommended that you rent/buy Tombs or Return first as the slow paced atmosphere of these films is certainly not for everyone. Some nice looking prints, and an interesting pair of documentaries on the bonus disc (although BU really missed an opportunity to include a dozen trailers for other projects in there as well) with a good booklet. The boxset is worth getting if you want to buy all four of the films.